This is a look south down Carson Street. The year is probably 1864-65. The photographer is set up at King Street in front of the Carson City Plaza, which at the end of the decade will become home to the Nevada State Capitol Building. 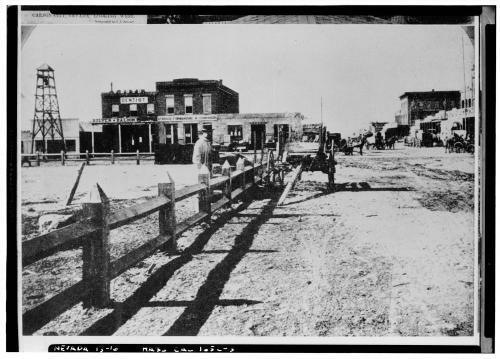 The wooden fence at left surrounded the Plaza, and later the Capitol, until Hannah Clapp erected a new iron fence in 1875. In the background, behind the buggy and the fellow posing for a portrait, you can see several businesses along Second Street. There is a dentist and the Silver Saloon in the T. Boyd Building, next door there is the Storage, Forwarding and Commission offices, and on the corner of Second and Carson is the low stone building that housed the Daily Appeal, Carson City's newspaper. In the background, past Second, the street gets more crowded with horses and buggies. 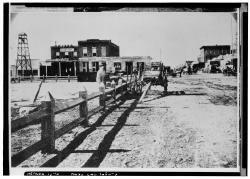 On the far right you can see the Ormsby House, which had already been expanded since its 1860 beginnings. And in the distance you can see the three-story St. Charles Hotel. The St. Charles is the only bit of this whole picture that still survives today.